HELLO COME TO CANCUN OR RIVIERA MAYA AND GET YOU LIKE BIG DISCOUNTS IN HOTELS, TOURS, clubs, walks on yachts, TRANSPORTATION AIRPORT !!! We also handle GROUPS !!! 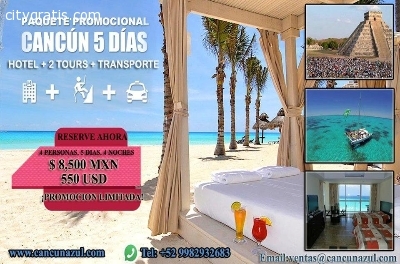 information only inbox or 01800 905 2828 within Mexico free (WhatsApp) 998 293-2683 our www.cancunazul.com thank you very much !! !